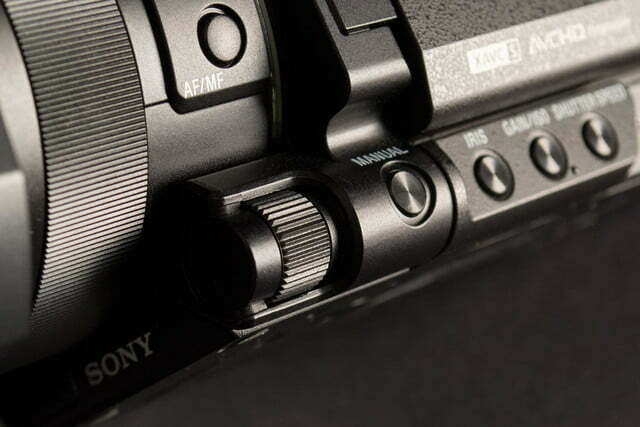 While the Sony FDR-AX100 is probably not going to be the first choice for professional shooters, they'd be foolish to rule it out, especially if they want to travel (relatively) light and still get great video. 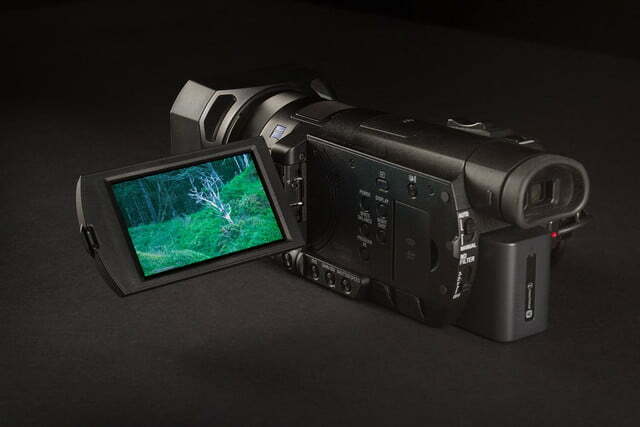 Digital imaging companies like Sony, Panasonic, JVC, and others are looking at ways to give people new reasons to buy a camcorder. 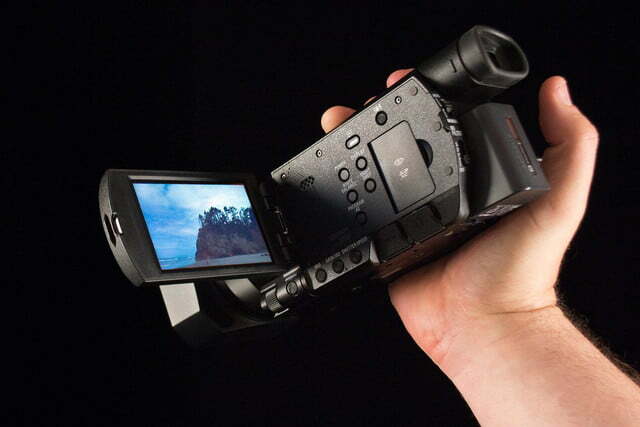 Why cart around a camcorder when your smartphone shoots HD video? The tiny cameras packed into cell phones, especially higher-end models like Sony’s Xperia, Apple’s iPhone, or Samsung’s Galaxy, take photos and video at a quality level only available from very spendy high-end standalone camcorders just a few years ago. So what can the big electronics companies do to entice consumers to plunk down hundreds or even thousands of dollars on a new camcorder that they have to lug around? 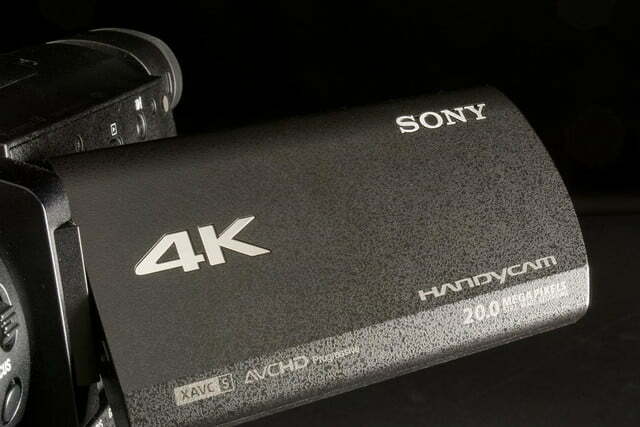 One way is to push video capture resolution way past HD, into the Ultra HD (UHD) or 4K realm, as Sony calls it in big shiny letters on the side of their new high-end 4K Handycam, the FDR-AX100. The AX100 is not some miniature marvel. At almost 8 inches long, it’s the size of one of their old 8mm Handycams from the 1990s and that is certainly intended. It also has a bit of heft, coming in at 2 pounds with the included battery attached. The semi-tubular body has a metal subframe covered in some grippy plastic, and overall, it has that “serious quality” feeling that makes you feel better about dropping two grand on it. 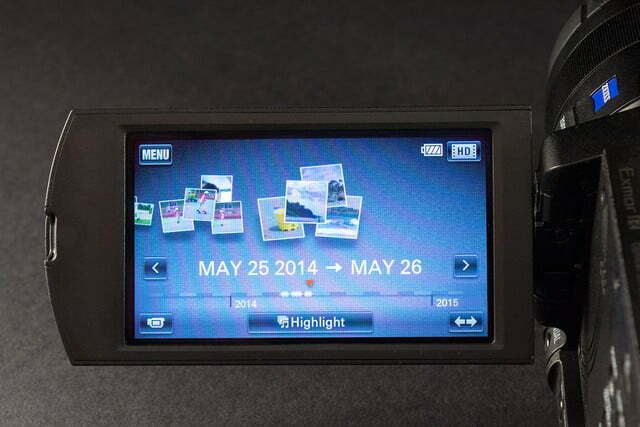 It maintains camcorder archetypes with major controls – zoom, start/stop, focus, fold-out LCD screen, etc. – in all the usual places. 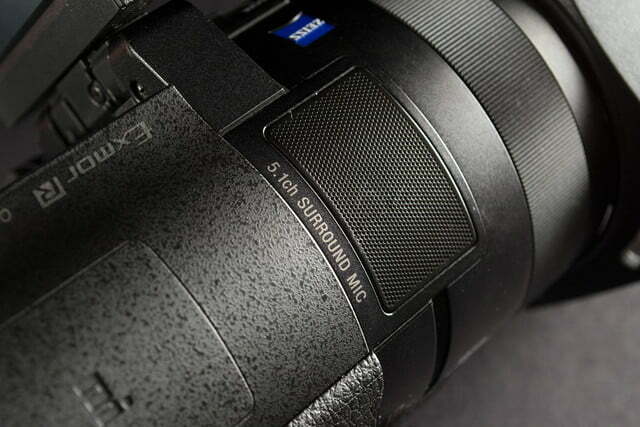 Shooting in 4K is the camera’s trump card, but it also shoots in 1080p HD or lower. We had the camera long enough (over a month) to learn the menu structure and tweak the controls to our tastes, as well as toy with some interesting features. Of course, shooting in 4K is the camera’s trump card, but it also shoots in two different 1080p HD modes or even lower resolution if you need to dumb it down for Web video or the like. 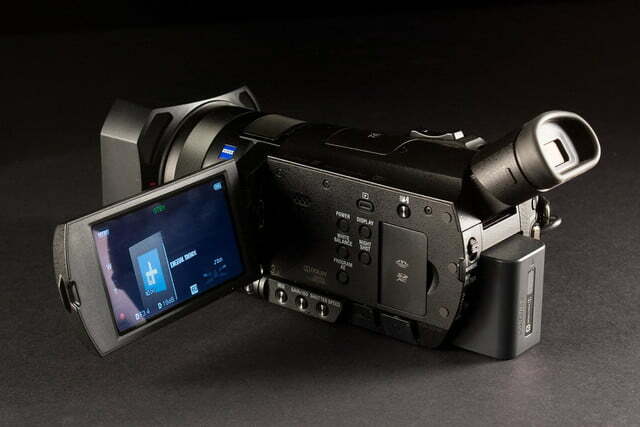 It can also shoot HD/4K and at lower resolution at the same time, which can save time in post-production. 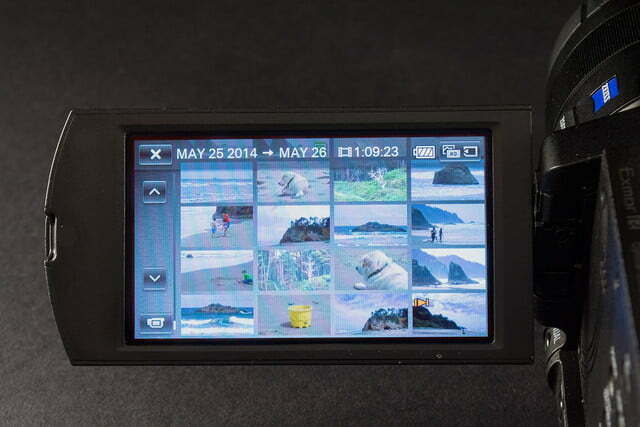 A sub-$40 Class 10 64GB SD card nets almost 14 hours of shooting time in “standard” AVCHD 1080p HD mode. Shifting to full-on XAVC S 4K mode cuts that time to a little more than 2 hours. There is also an intermediary XAVC S HD mode (essentially a higher-bit HD mode) as well, and 64GB will get you about 2.5 hours. The difference, of course, is data rate, with the XAVC modes through-putting massive amounts of video bits. And to think we used to be concerned about HD data rates being too large. Ah, the good old days. Opening the 921,000-pixel (1920 x 480) touchscreen quickly brings the AX100 to life, as does pulling out the 1.4-megapixel adjustable OLED viewfinder, which also swivels up. Yes, there is an actual Power button, located on the button panel under the LCD screen, which is handy for powering the camera on or off in a more prosumer setting, such as a professional shoot where it might be on a tripod for long periods of time. 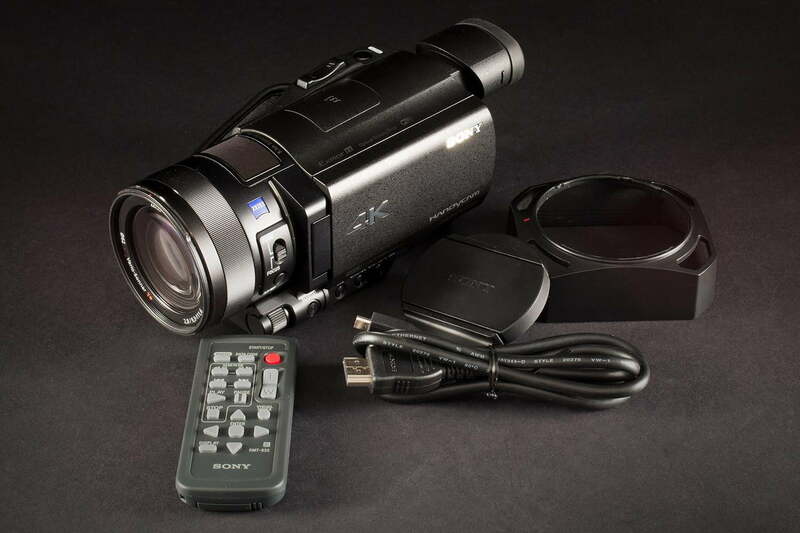 While previous camcorders of this size have featured a three-chip design, the AX100 uses a single 1-inch Exmor R back-illuminated CMOS sensor topping out at 20.9 megapixels. Glass is comprised of a Zeiss configuration with a Vario-Sonnar T* lens array, which features a native 12x optical zoom spanning a 35mm equivalent of 29mm-348mm and a constant f/2.8 maximum aperture. 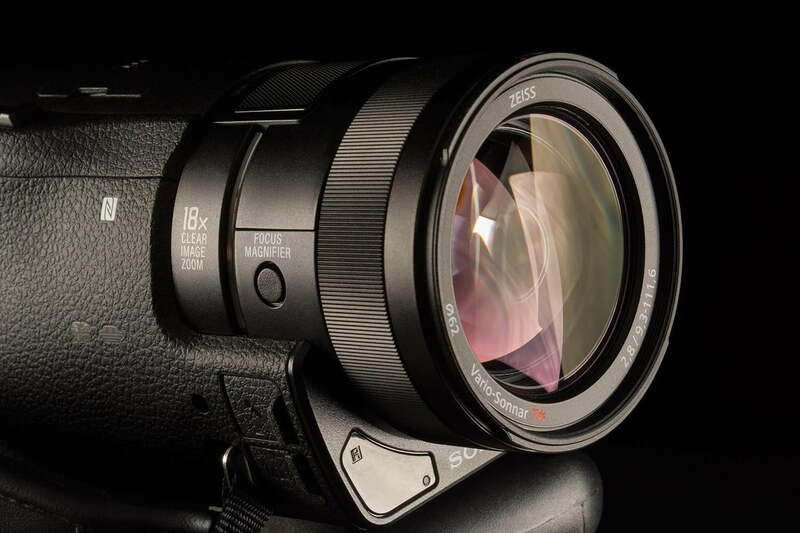 Sony’s spec sheet says the lens zoom is 18x in HD mode and 12x at 4K, with a 24x digital option using “Clear Image Zoom.” Zoom can be extended to 160x using more digital trickery, but the results are predictably bad. 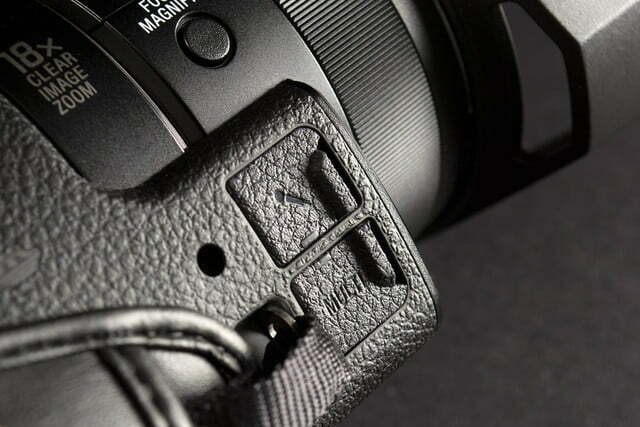 The AX100 has two control rings. 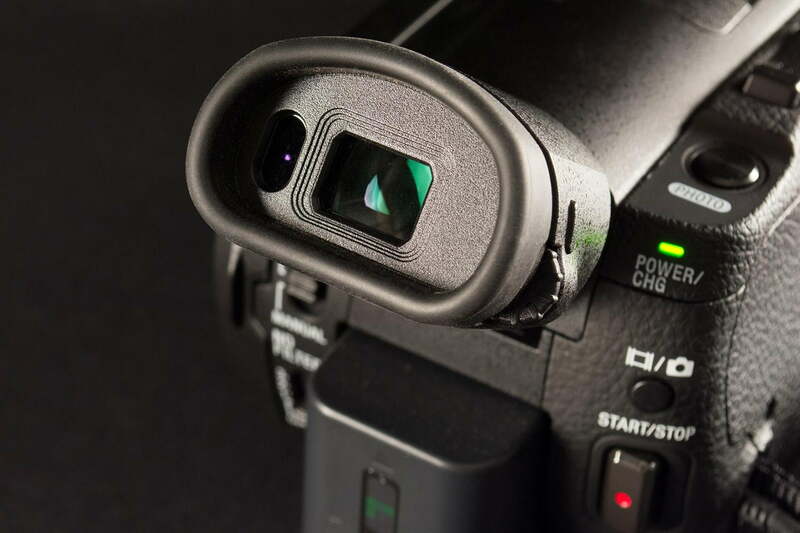 There’s a large one in the usual spot near the front of the camera, and it can be toggled between zoom and focus control with a small slider switch near the ring itself. Another small finger-roller ring nearby can be assigned different functions. The sensor systems in the large ring is less precise than we’d like: very slow zooming or fine focus control was sometimes a bit jumpy when trying to execute the very small adjustments that a non-digital, mechanical system could. 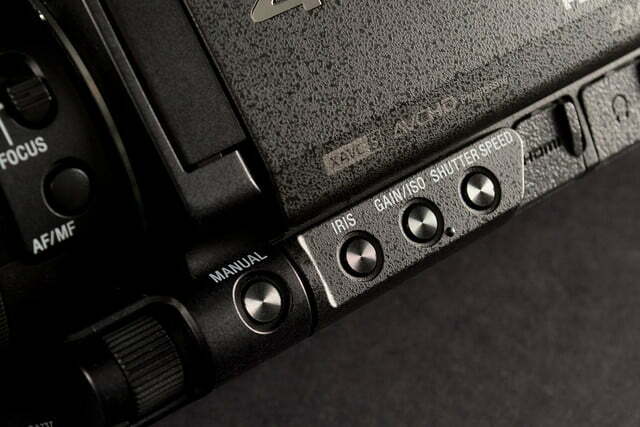 Three buttons below the LCD screen quickly switch the duty assignment of the small roller wheel between iris, video gain, and shutter speed. 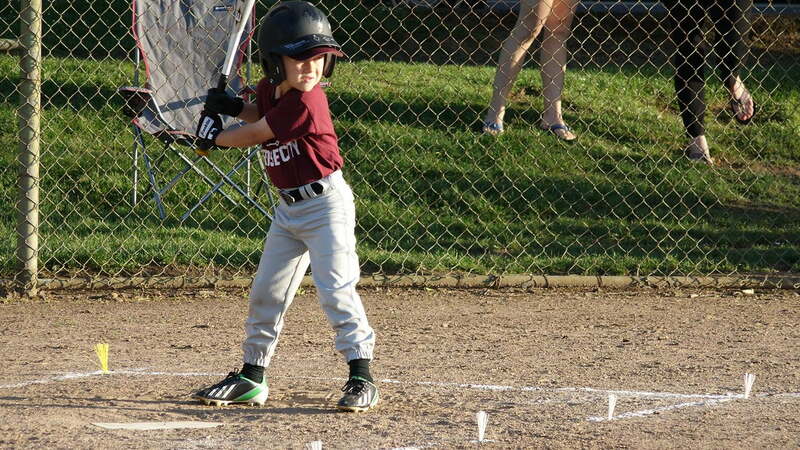 In photo mode, the gain control also adjusts ISO. A “photo” button sits behind the zoom rocker on top of the camera; pressing it lets you take 14-megapixel still photos while recording video. We aren’t sure that’s the best placement, as we got some unintended stills while holding the camera at a low level, but it was never annoying and some of the accidental photos turned out quite good! 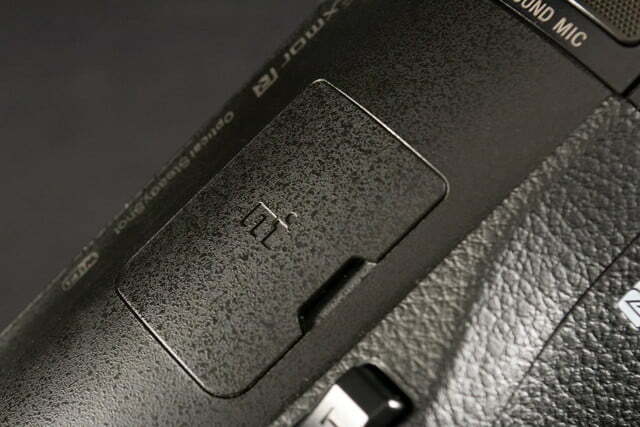 On the right side of the lens, a “focus magnifier” button is the sole control here (although the NFC touch point is next to it). 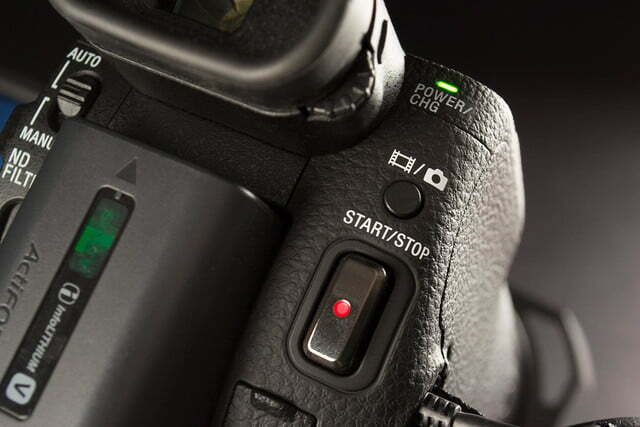 A small button above the large start/stop key toggles quickly between video mode and the pure 20-megapixel photo mode, and it’s unlikely you’ll ever hit it accidentally (we never did). 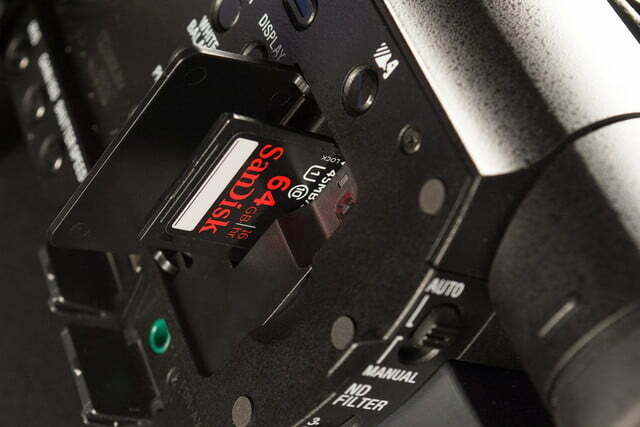 Across from the start/stop button, on the other side of the battery, is the neutral density filter switch (for shooting under very bright conditions, reducing the amount of light entering the lens), which has four settings if you include “off.” The ND filters can be manually controlled or set to automatic, in any shooting mode. 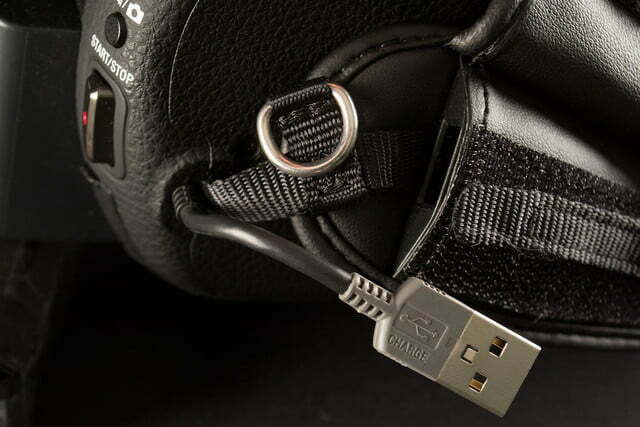 Sony has tucked a short USB cable into the handgrip, which turned out to be handy on several occasions. Aside from transferring data, it can also charge the battery or power the camera from a common USB-type portable phone-charging power pack. Other connectivity options including Wi-Fi and NFC pairing. 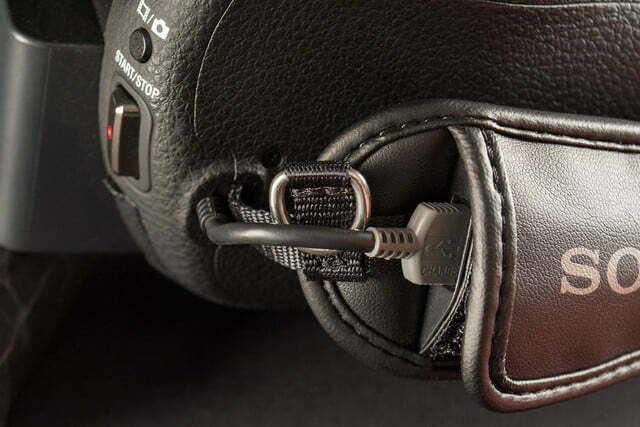 Connections for hard wires live under stout little doors all over the camera, including mini-HDMI, AC/DC power, 1/8-inch mic jack, and a “multi” connector for attaching an external storage device (no matching cable is included for this connector). 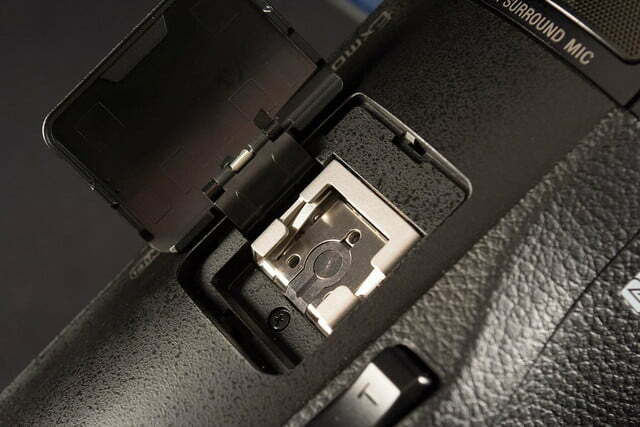 A standard-style hot shoe with a multi-pin interface hides under a door atop the camera. 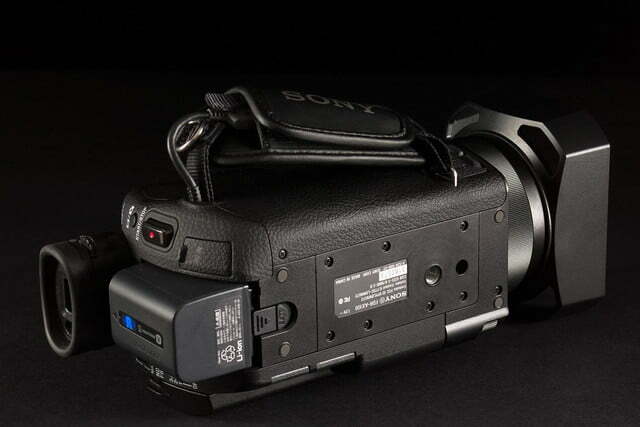 The hot shoe, which Sony calls the Multi Interface shoe, is compatible with a range of interchangeable accessories that can be shared with new Handycam camcorders and Alpha and high-end Cyber-shot digital cameras. 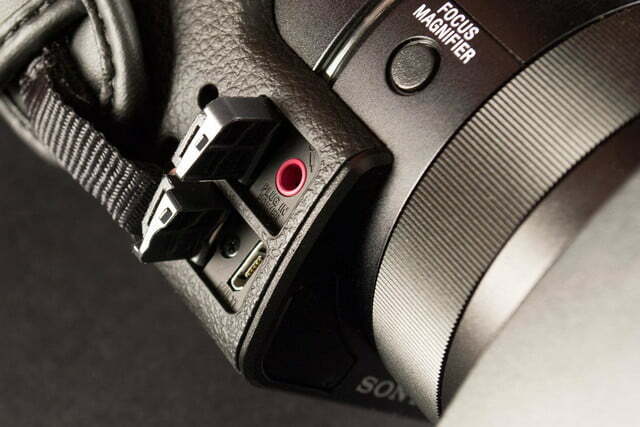 And while the camera does include that little red mic jack, Sony also offers a dual-XLR adapter that plugs into the hot shoe. While the built-in 5.1-channel mic pod, which sits flush in the top of the camera, does a decent job of capturing ambient sound, we strongly suggest you add the XLR-K1 XLR mic module to your shopping list if you have any plans to use this camera in a professional environment. Be warned, however, as it retails for $800. 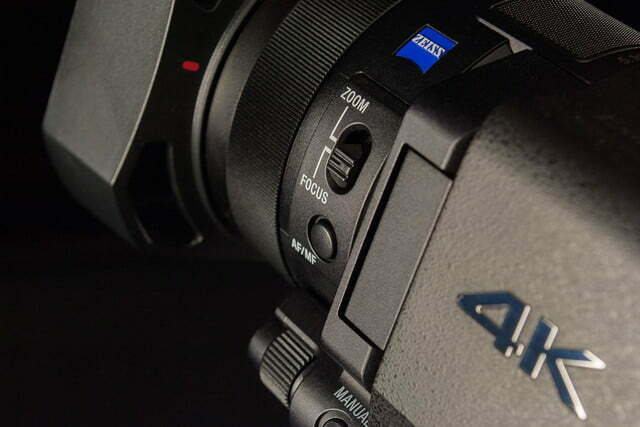 Sony is implementing Wi-Fi connectivity into most of its new digital imaging products, including the AX100. For these Wi-Fi-capable models, there’s a companion Sony app called PlayMemories (iOS and Android), which allows remote camera control and viewing. 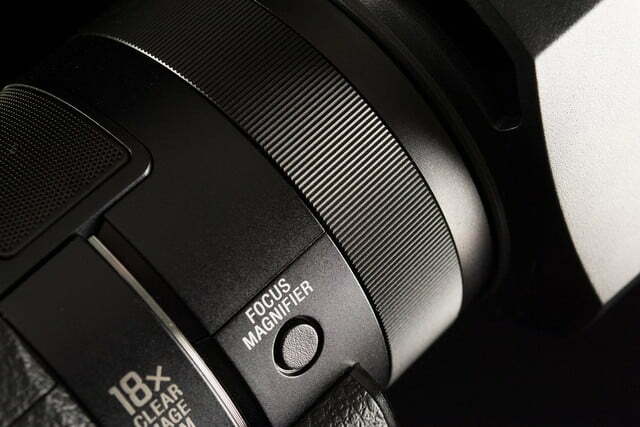 It can toggle between video and photo modes, as well as control the zoom lens. It’s simple yet highly functional, and the video on the phone seemed to have little or no lag compared to what was on the camera’s LCD screen. You can’t affect changes through the app such as video type (HD/4K) or go into camera settings. Such enhanced functionality would be really convenient; here’s hoping they build it into future app updates. Also, finding the menu entry to sync the camcorder with your phone requires a bit of menu drill-down; it would be better if this was a more prominent menu choice or even had a dedicated Wi-Fi pairing button; those with NFC-capable phones can enact pairing much quicker. 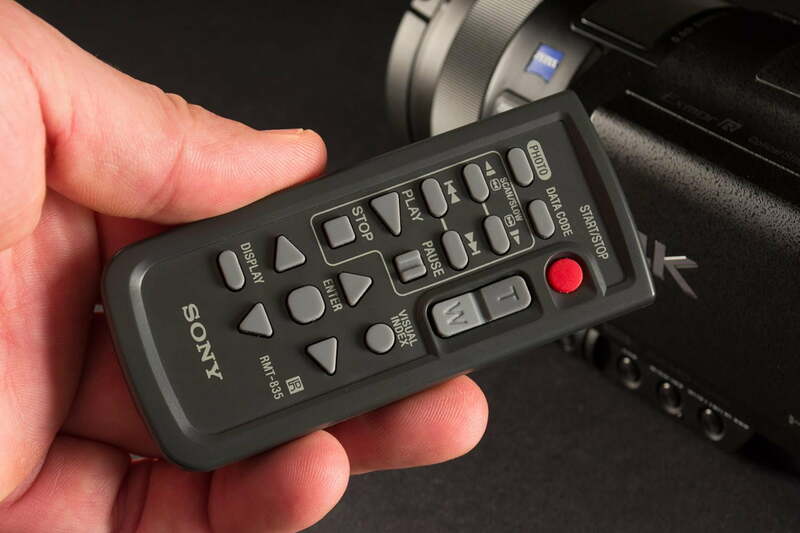 A small, old-school analog infrared remote is also included, which does allow essentially full control over the camera’s many menu options and recording key, as well as zoom. But you must be able to see the LCD or have an external monitor attached to the camera to see where you are in the menu structure. The included lens sunshade tends to block the IR receiver window when in place, resulting in a lot of unrecognized commands (hint: aim low). This reviewer is an old-school shooter who prefers a viewfinder, but using the wide-aspect foldout LCD touchscreen monitor was enjoyable. The image was sharp enough for fine focus and had good color, unless it was in direct sunlight, which washed it out and heightened the evidence of fingerprints. A sunshade would remedy that issue, but that would also make the touchscreen harder to operate. 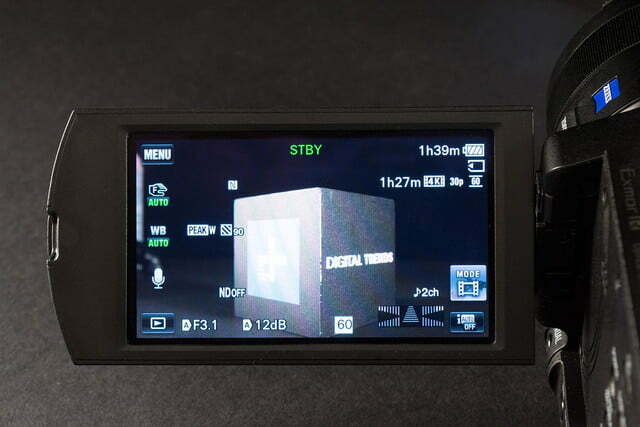 Thankfully, the excellent OLED viewfinder is perfect for shooting in bright conditions, but the menu looks oddly cropped and the 5-channel audio meter display takes up too much real estate. 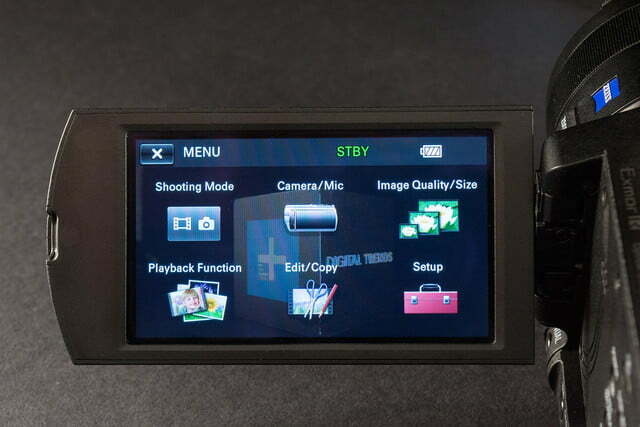 What shooting info appears on the viewfinder can be somewhat controlled using the Display button under the LCD panel; whatever you pick to show on the LCD will also show in the viewfinder, but it’s sort of an all-or-nothing proposition. The Display Options button should be elsewhere on the camera, not under the LCD screen where you can’t toggle it when using the OLED viewfinder. A workaround for this is to use the Display button on the infrared remote to toggle the viewfinder information options. The six primary menu icons on the LCD touchscreen are big and easy to hit, but they sometimes required an extra push to activate. Worse, once you drill down into submenus, the icons shrink considerably and become even harder to correctly activate. But, it doesn’t take long to learn the overall menu interface. A bit lighter touch to activate an onscreen button and even faster response would be welcome. For pro video users: You can dial in settable zebra and focus highlight controls per usual, and there are three levels of info overlays: lots, basic, and none (save REC/STBY). Also present on the LCD as touchscreen buttons are start/stop and zoom controls, but we tended to use the physical controls in most situations. 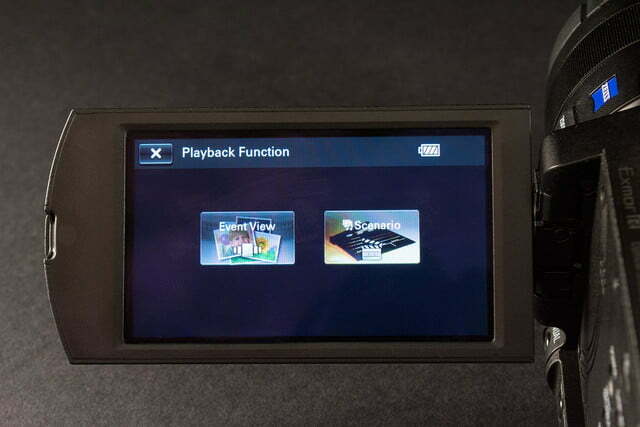 Playback on the LCD looked sharp, and we appreciated swing-out panel’s open-to-activate-close-to-sleep functionality. As stated before, the camera boots up quickly from sleep – we’d say in just a tick over 2 seconds. If the camera has been off for some time, it will do a full boot-up that takes about 5 seconds. We used the camera in two modes: purely automatic, and also with every manual control we could control. Left on full autopilot, the AX100 performs about as expected. The autofocus has a bit of trouble finding its legs as the camera boots up, but once locked in, the focus tracks moving objects well and is effective almost down to the surface of the lens. While the AX100 is probably not going to be the first choice for professional shooters, they’d be foolish to rule it out. A little logo on the side of the lens claims “18x Clear Image Zoom” and in standard HD it seems to work well enough, with only minor artifacts creeping in at full 24x mag. When pushing up to 160x, quality suffers quickly as the number climbs, but it could be just the thing for getting shaky shots of Bigfoot, E.T., or the latest government conspiracy – otherwise, pretty useless. Sony’s optical image stabilization system, Optical SteadyShot, does the usual good job of quelling hand-shakes up to about 12x, but beyond that it pretty much looks like a drunken sailor shot your video. We shot in a variety of conditions including rain, but a quick note here that the AX100 has no weatherproofing whatsoever – do take care to keep it dry. 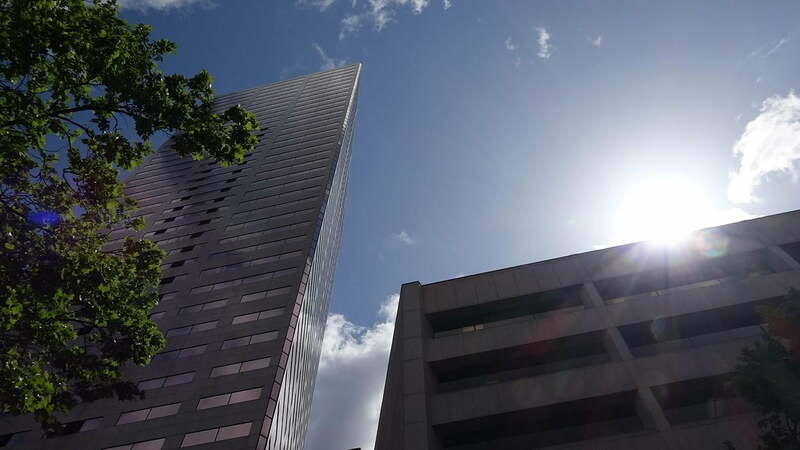 On a day mixed with clouds and sun in downtown Portland, Ore., the AX100 collected crisp footage when stopped down to the largest f-stop (f/4.5), with fairly amazing depth of field, even when shooting highly compressed scenes. On the other end of the scale, with the ND filters activated, racking focus produced a usable bokeh but nothing that’s going to challenge what you can accomplish with a DSLR or something a bit more upmarket, such as Sony’s FDR-AX1, the $4,500 big brother to this camera. 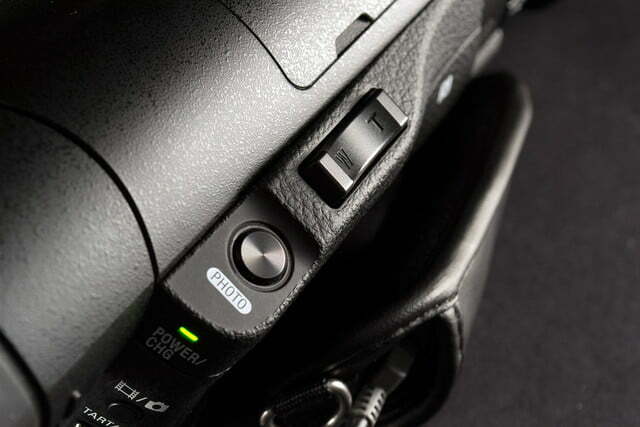 Switching over to photo mode, the AX100 will capture 20-megapixel stills at its maximum setting. 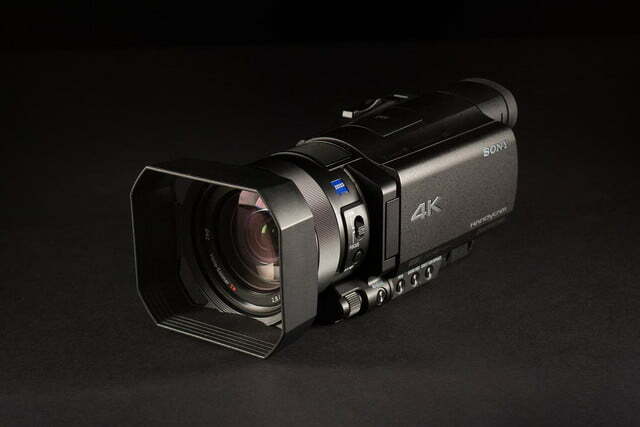 It seems, finally, that Sony has implemented still camera performance into a video camcorder that actually rivals what you get from a decent, dedicated still camera. Photos didn’t have the purple fringing, flat color, and artifacts that have plagued camcorder-shot stills since the function was dreamed up. The AX100’s photos were sharp and colorful, even coming from the shot-while-shooting-video mode (albeit in 16:9 format, which isn’t a bad thing). In pure 3:2 20MP photo mode, quality ticks up and when played back on a 65-inch 4K TV, detail was very impressive, although both photos and video seemed to lack a touch of contrast, something that can certainly be remedied in post or with more settings tweaks. 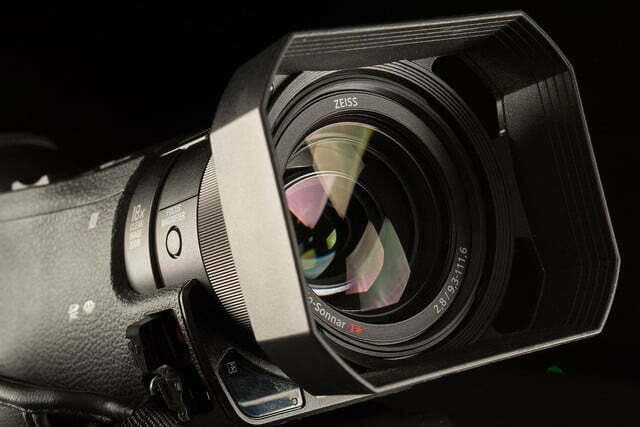 Besides cinematography tools like 24p recording, several cinema modes, numerous creative filters, and so forth, the AX100 has two special video recording modes: a 3-second slow-motion capture mode and “Golf Shot.” We tried both but came away somewhat disappointed. The slow-motion feature works as advertised: shooting at 120 frames per second, playback on the LCD is buttery smooth and looked great. On the big screen, not so much. Definition and color take big hits, which was disappointing. “Golf Shot” was even more superfluous: You line your favorite golfer up in a vertical box and then hit the “go” button – just make sure the swing happens in a small window of time, like 3 seconds. The AX100 then pieces together 20 vertical frames in a cascading mosaic that shows each part of the swing. Again, it looks OK on the LCD, but playback on a TV or computer shows a lot of noise and, truthfully, the feature is so low-resolution and the frames so compacted it’s not worth using. It would be easier and look better to just shoot in slo-mo mode, 4K, or HD, and then slow it down on playback. 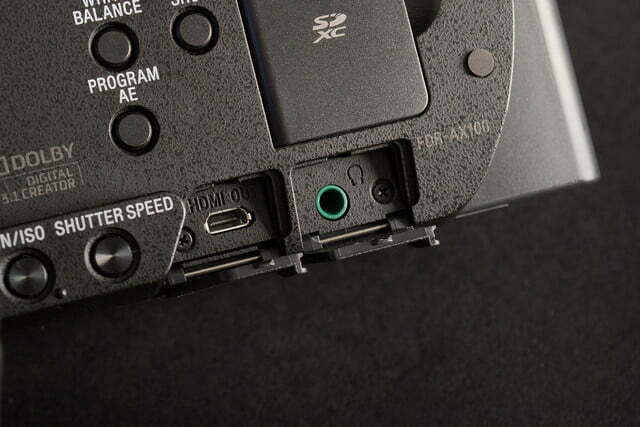 Note: The two special video modes are not available while shooting in 4K mode. 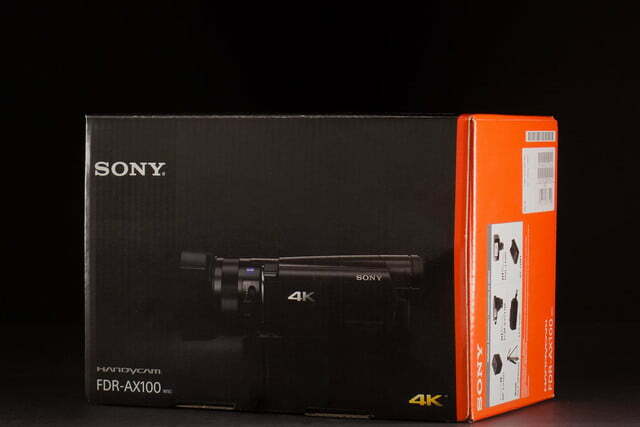 We shot scenes in both AVCHD 1080p Full HD mode and in 4K mode, and it’s here the AX-100 earns its keep (and price tag). With the camera jacked straight into a 65-inch 4K UHD TV’s HDMI port (not a Sony) and picture controls set to standard, identical scenes shot both in 1080p HD and 4K clearly illustrate the superiority of the 4K UHD codec. Details that look good in HD become tack-sharp in 4K. 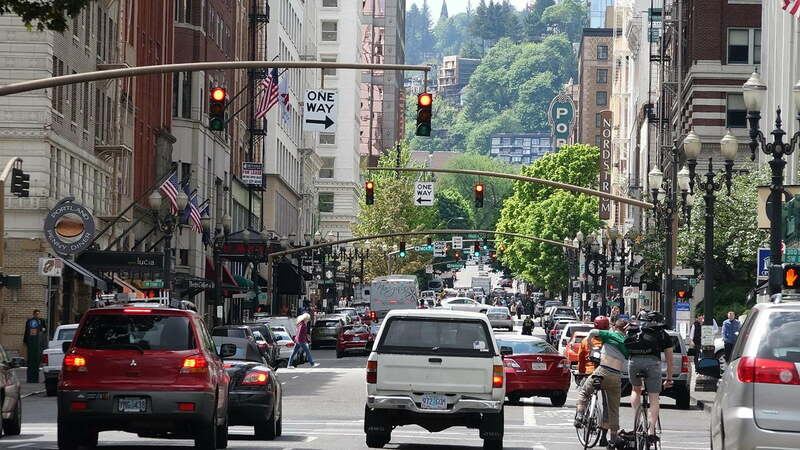 Color, contrast, and saturation also tick up as the data stream widens. Single strands of a spider web, barely visible in HD, jumped off the screen in 4K, while both color saturation and fidelity clearly improved. 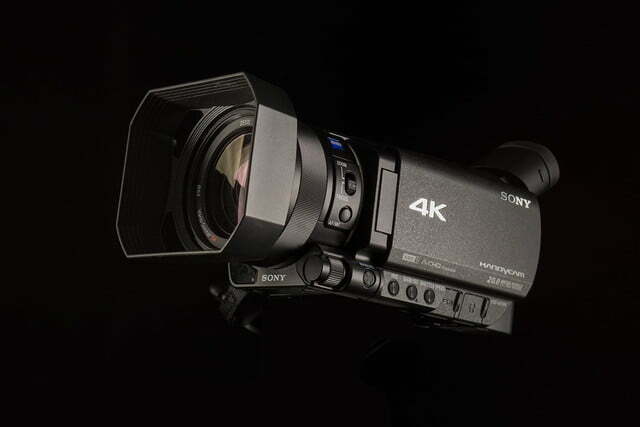 And to think this is a first-gen consumer 4K camera! The future for videographers looks brighter and more clear already. Tracking focus while shooting in Full Auto was pretty much faultless, with the only odd thing being the long time (5 seconds or more) it takes for the camera to initially find focus after booting up. But once locked in and with its AI engaged (facial tracking, etc. 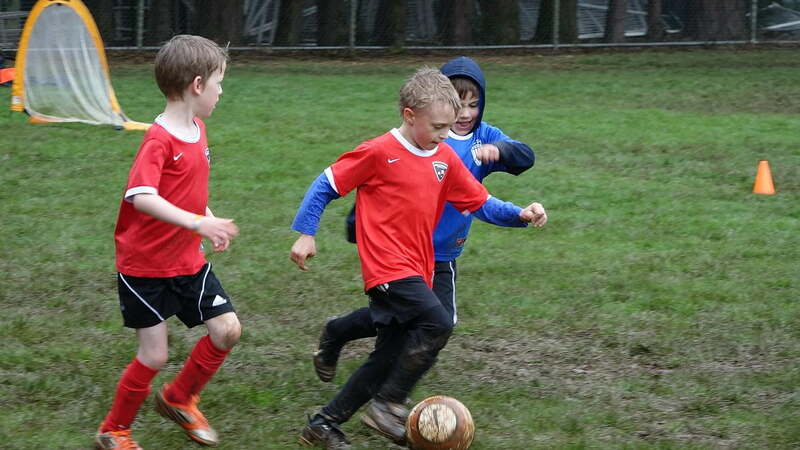 ), the AX100 was pretty much foolproof – even at long zoom settings tracking fast-moving seven-year-olds battling it out on a soccer field. On the other end of the user spectrum, setting all controls to manual resulted in very professional-looking scenes, although slowly racking focus or zoom was sometimes foiled by the indelicate focus ring sensors. Low light is a challenge for any camcorder, but footage we shot of a piano being played inside a house at night – with only two low-watt incandescent table lamps for illumination – turned out especially good, with little noise and even correct exposure despite one lamp being directly behind the subject’s head. Overall, we were very impressed with the video image quality, especially at 4K. This reviewer remembers the first time he saw pro-shot HD video on a big plasma screen, and was bowled over. This jump in quality to 4K is on the same level, and casual viewers who looked over our shoulder while we checked out the footage on the 4K TV were equally entranced and impressed with the incredible detail of the video. However, for many consumers, there’s no need to go 4K at this time, especially if you just sunk a small fortune into HD gear like this reviewer did. Even though a 65-inch 4K LED TV is relatively affordable at about $3,500 regardless of brand, the dearth of 4K content (Netflix’s promises not withstanding) means there’s not enough justification for it just yet. 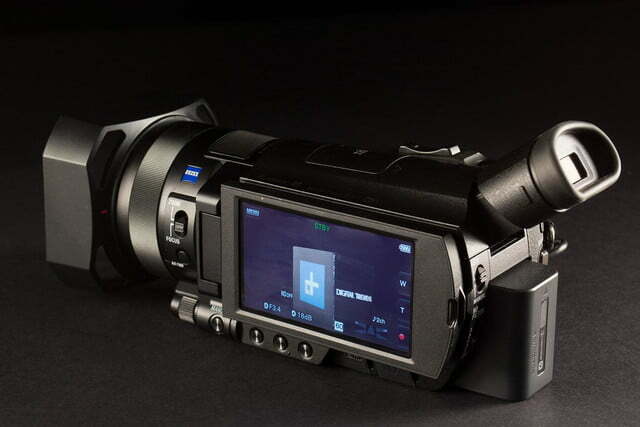 But it also highlights the future-proof nature of the AX100 and other early 4K camcorders. If you get one, at least it won’t be obsolete in two years – unless that 8K UHD thing takes off faster than expected. But for now, seeing the clarity and pop of 4K this early in the game from a consumer device convinces us that, despite the heavy sighs of upgrade-weary consumers, 4K is the future both in terms of viewing and shooting video. And you know it’s only a matter of a very, very short time until 4K recording finds a home in top-tier cell phones. 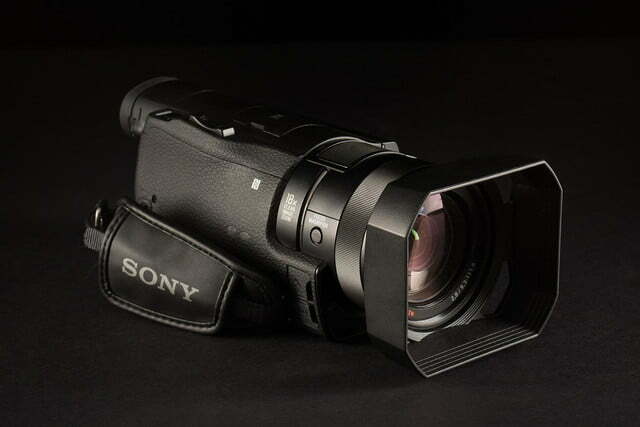 But for now, there is the Sony AX100. While the AX100 is probably not going to be the first choice for professional shooters, they’d be foolish to rule it out, especially if they want to travel (relatively) light and still get great video. 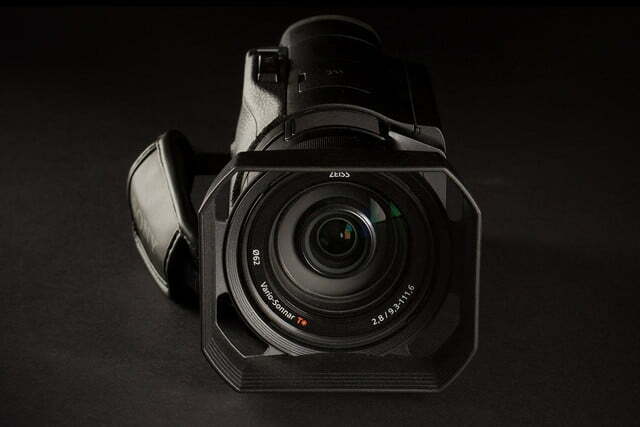 Compact, sturdy, and with high performance right from the start, the AX100 is certainly expensive, but it remains a smart choice for serious shooters wanting the highest performance, pro-level adjustability, great still photos, and a solid point-and-shoot option in a smaller package. The size, build quality, and recording abilities of the camera gives photographers a chance to capture video at a premium quality level that will endure (at least for a while). 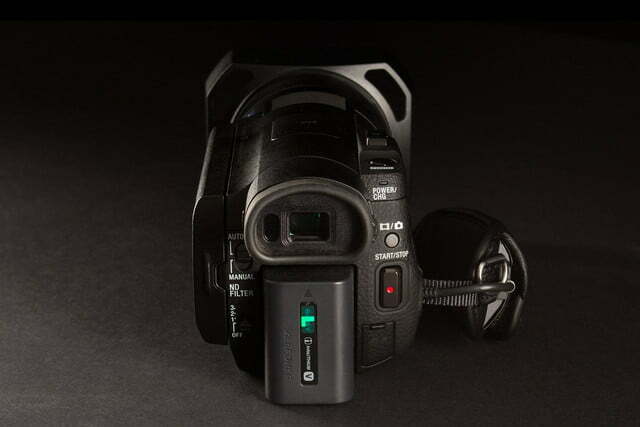 The camcorder comes with a battery, AC adapter and power cord, Micro HDMI cable, USB cable, remote control, lens hood, lens cap, and an operating guide. Sony includes a limited one-year warranty on parts and 90 days on labor, but offers extended service plans. Considering this is an expensive first-gen product, you may want to add one if the budget allows.